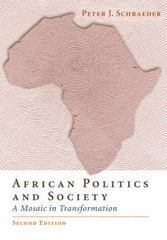 African Politics and Society 2 Edition AFRICAN POLITICS AND SOCIETY: A MOSAIC IN TRANSFORMATION is the first single-authored textbook to examine continuity and change in African politics and society from the pre-colonial era to the present. It fills the needs of those with little prior knowledge while balancing this background information with thorough analysis for those already familiar with the subject. An emphasis has been placed on making sense of general developments on the African continent as a whole while introducing the distinctive natures of Africa's 53 countries. Each chapter emphasizes the major trends associated with a topic, trends that are further explored through illustrative case studies that represent all regions of the African continent. Each chapter concludes with a list of readings for further exploration and research. Numerous maps, tables, figures, and boxed elements highlight fundamental issues of interest. Because each chapter stands alone, instructors can assign chapters that relate topics that are of greatest relevance to the course or reorder chapters to better suit their syllabi.